If you are not old enough to have lived through and enjoyed the long wave of Glam Metal bands that were popular mostly in the 1980’s, I am sorry. It was a very enjoyable time for music that was off the pop grid, but accessible enough to be enjoyed by any music fan. It was largely a movement in the United States, but let’s not forget about the Nordic pioneers; Finland’s HANOI ROCKS, Sweden’s EUROPE, and Norway’s TNT, to name but a few. 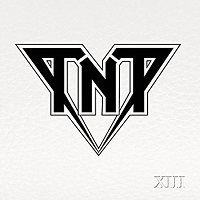 TNT recently celebrated the 30th anniversary of the album “Tell No Tales,” famous mostly for the glass-shattering vocal range of singer Tony Harnell, and the unique, oft-spastic, and burning fretwork of guitarist Ronni Le Tekro. 30 years from then, the band carry on with vocalist Baol Bardot Bulsara. “XIII” contains twelve tracks. “Were Gonna Make It” opens with the chorus slamming in, followed by a tender verse passage. In case you’re wondering, Baol more than has the pipes to pull off the sound. It reminds me of the replacement process to find a singer to front JUDAS PRIEST when Halford left. Where must they have begun? I don’t know, but they certainly found a winner. Le Tekro still has the magic in his fingers as well. “Not Feeling Anything” is an energetic and upbeat song with an easy listening guitar riff and vocals that venture high. “It’s Electric” opens with an odd set of guitar riffs and harmonized vocals. It’s all about the rhythm in this track. If someone didn’t tell me this was a TNT song I would probably not recognize it from their work. There is nothing wrong with expanding your sound, however, so don’t get me wrong. “Where You Belong” open with a somber tone and high running emotions. It’s definitely a ballad but it sounds like they had some trouble with the final destination of the song as a whole. “Can’t Breathe Anymore” is more like it. Some keys mix in nicely with the guitars, resulting in a fuller sound. The focus is on easy connecting melodies and a tender pace to soak it all in. “Are You Ready for Some Hard Rock” is an anthem of sorts, but it falls pretty flat, with cliché riffing and rhetorical questions in the lyrics. This would have been pretty un-original even thirty years ago. “People Come Together” hears the pace pick up and some more fire in the sound. Again, though we hear some oddly connected chord progressions which don’t ever really come to conclusion. There must be some significance to the date in the song “17th of May,” but I don’t know what it is. Sonically however it is another really eccentric song that just doesn’t have much impact. “Catch a Wave” is more in line with that soft AOR sound that has a meaty edge from the guitars. It might be the best and most memorable song on the album and has a sound that is just positive and high spirited. “Sunshine” is a tender closing song with pensive vocals and acoustic guitars. The chorus is the shining moment here. Overall, I would be remiss without immediately mentioning that this is not like their older material at all. This is not a judgement, just a statement for your expectations. Of all of the problems I thought that they album might have, I never thought it wouldn’t be the replacement of Tony Harnell. Indeed, Baol has a wonderful and versatile voice. The trouble is largely in the songwriting. It’s an eccentric mix of sounds, so there is diversity, which is always a good thing. But the writing sounds incomplete and uninspired for the most part. I wasn’t expecting a revival of the past, but just something to connect with.